Garlic is a member of the onion family, all of whose members are rich in a variety of powerful sulfur-containing compounds, including thiosulfinates, sulfoxides and di- thiins�compounds responsible both for garlic�s characteristically pungent odor and for its health-promoting effects. Garlic is an excellent source of manganese, a very good source of vitamin B6 and vitamin C, and a good source of selenium, though you probably won�t eat enough of it for it to serve as a significant source of any of these nutrients. The sulfur compounds in garlic and other alliums appear to stimulate the production of nitric oxide in the linings of blood vessels, which helps to relax them and may lower blood pressure. Garlic is also rich in antioxidants. Three cloves of raw garlic provide 13 calories, 3 g carbohydrate, 0.6 g protein, 0 g fat, 0.2 g dietary fiber, 3 mg vitamin C, 36 mg potassium, 2 mg sodium, 14 mg phosphorus, 16 mg calcium, and 2 mg magnesium. Historically, ginger has a long tradition of being very effective in alleviating symptoms of stomach discomfort. In herbal medicine, ginger is regarded as an excellent carminative (a substance that helps eliminate intestinal gas) and intestinal spasmolytic (a substance that relaxes and soothes the intestinal tract). Modern scientific research has revealed that ginger possesses numerous therapeutic properties, including antioxidant effects, an ability to inhibit the formation of inflammatory compounds, and direct anti-inflammatory effects. The possibility that gingerol, the main active component in ginger and the one responsible for its distinctive flavor, may inhibit the growth of human colorectal cancer cells was suggested in research presented at a major meeting of cancer experts in 2003. One-fourth cup of fresh ginger slices provides 17 calories, 3.6 g carbohydrate, 0.4 g protein, 0.2 g fat, 0.5 g dietary fiber, 3 mcg folic acid, 100 mg potassium, 3 mg sodium, 6 mg phosphorus, 4 mg calcium, and 10 mg magnesium. Green tea is light in color because of incomplete fermentation of the leaf. White tea is tea whose leaves are picked before they open fully, when the buds are still covered with fine, white hairs. That, of course, is why it�s called �white� tea. Green tea and white tea come from the same plant, the tea plant Camellia sinensis. The main difference between the two types of tea is that the white tea leaves are harvested at a younger age than the green tea leaves. They both undergo very little processing, though white tea is the least processed of any tea. Green tea is only partly fermented, and white tea is not fermented at all. By contrast, black tea is fully fermented. Because they are so gently treated, green tea and white tea retain higher amounts of their beneficial antioxidants. Studies have shown that white tea has a concentration of antioxidants that is three times higher than that of green tea. White tea contains less caffeine than green tea, about 15 milligrams per serving compared to 20 milligrams per serving for green tea. If caffeine tends to make you jittery, white tea may be the better choice. White tea has the highest antioxidant content of any tea, which for many is the main reason for drinking it. As a comparison, one cup of white tea contains approximately twelve times as many antioxidants as fresh orange juice. Active ingredients of green tea and white tea, including catechin, theanine, and saponin, work to scavenge active oxygen species in the blood, helping protect the body from harmful microorganisms. One fusion green and white tea bag provides 0 calories, 0 g carbohydrate, 0 g protein, 0 g fat, and 0 g dietary fiber. Horseradish is a member of the Brassica family, like broccoli and Brussels sprouts. Like other Brassica, horseradish contains significant amounts of glucosinolates� compounds that have been shown to increase the liver�s ability to detoxify carcinogens and that may suppress the growth of cancerous tumors. But horseradish is especially rich in these compounds, providing ten times as many of them as broccoli does. Horseradish is also said to aid digestion and contains compounds known to fight pathogens in food, such as Listeria, E. coli and Staphylococcus aureus. One tablespoon of prepared horseradish provides 6 calories, 1.4 g carbohydrate, 0.2 g protein, 0 g fat, 0.5 g dietary fiber, 44 mg potassium, 14 mg sodium, 5 mg phosphorus, and 9 mg calcium. Marjoram is an herb with aromatic leaves. The flavonoids in marjoram have sedation qualities that help relieve insomnia, tension headaches, and migraines. They may promote a healthy heart and healthy arteries by preventing cholesterol buildup and improving blood circulation. It is also thought that they help individuals with Alzheimer�s disease. Marjoram has anti-inflammatory properties that can be beneficial for both internal and external use. It alleviates aches and pains and, when used externally, aids in the reduction of toothaches, muscular pain, bruises, arthritis, sprains, and stiff joints. Used internally, it eases severe stomach cramps, spasms, and painful menstruation. One teaspoon of dried marjoram provides 3 calories, 0.6 g carbohydrate, 0.1 g protein, 0.1 g fat, 0.4 g dietary fiber, 81 IU vitamin A, 1 mg vitamin C, 3 mcg folic acid, 15 mg potassium, 1 mg sodium, 3 mg phosphorus, 20 mg calcium, and 3 mg magnesium. Mint is a powerful antioxidant that contains many vitamins and minerals. This fresh herb is rich in vitamins A, C, and B12, thiamine, folic acid, and riboflavin, as well as the minerals manganese, copper, potassium, iron, calcium, zinc, phosphorus, fluoride, and selenium. Mint has been used for centuries to aid digestion and relieve indigestion. The chemical compound menthol, derived from peppermint oil, is well known for its therapeutic effect on the chest and respiratory system. It has also shown potential to inhibit the formation of cancerous cells and the growth of bacteria and fungus. Peppermint oil is rich in monoterpene perillyl alcohol, which has shown potential against pancreatic, mammary, and liver tumors in animals. Two tablespoons of fresh spearmint provides 4.9 calories, 0.9 g carbohydrate, 0.4 g protein, 0.1 g fat, 0.8 g dietary fiber, 456 IU vitamin A, 11.8 mcg folic acid, 7.1 mg magnesium, 6.8 mg phosphorus, 51.5 mg potassium, and 3.4 mg sodium. 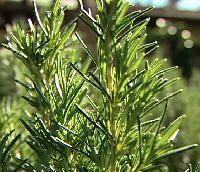 Rosemary, a versatile and much-loved green herb, has recently shown potential against cancer and age-related skin damage. Caffeic acid and rosmarinic acid, which are potent antioxidant and anti-inflammatory agents, are believed to be the active elements. These two natural acids appear to safeguard a protective protein called Hsp70, which itself reduces damage from stress and toxins. Rosemary extract may also inactivate toxins and help eliminate them from your liver before they can inflict any serious damage. One tablespoon of dried rosemary provides 10.8 calories, 2.1 g carbohydrate, 0.2 g protein, 0.5 g fat, 1.4 g dietary fiber, 102 IU vitamin A, 2 mg vitamin C, 10 mcg folic acid, 41.6 mg calcium, 1 mg iron, 7.1 mg magnesium, 2.3 mg phosphorus, 31 mg potassium, and 1.6 mg sodium. Saffron crocus is a flowering plant that is usually used as a spice. However, it is also used in herbal supplements. Some of the compounds in saffron may have anticancer activity; others may stimulate the secretion of stomach acids and can stimulate the contraction of smooth muscles (such as the uterus). Compounds in saffron may also have some effect on lowering cholesterol and triglyceride levels. One teaspoon of saffron provides 3 calories, 0.7 g carbohydrate, 0.1 g protein, 0.1 g fat, 0 g dietary fiber, 5 IU vitamin A, 17 mg potassium, 3 mg phosphorus, and 3 mg magnesium. Like rosemary, its sister herb in the mint (Labiatae) family, sage contains a variety of volatile oils; flavonoids, including apigenin, diosmetin, and luteolin; and phenolic acids, which act as anti-inflammatories. 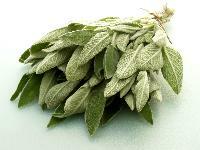 Sage has also shown potential to enhance memory. One teaspoon of ground sage provides 3 calories, 0.6 g carbohydrate, 0.1 g protein, 0.1 g fat, 0.4 g dietary fiber, 59 IU vitamin A, 3 mcg folic acid, 11 mg potassium, 17 mg calcium, and 4 mg magnesium.